The international Bologna airport Guglielmo Marconi or Bologna airport (Aeroporto Guglielmo Marconi di Bologna or Aeroporto di Bologna) - the tenth international airport in Italy in terms of passenger traffic. Named Bologna airport, in honor of the engineer and Nobel laureate Guglielmo Marconi. 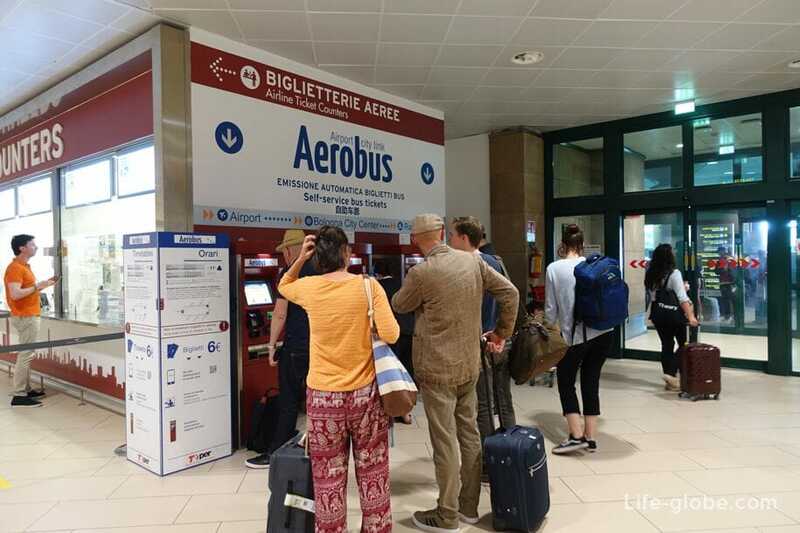 Bologna airport has a well-developed transport links to the city centre, so you can easily get from the airport to the center or from Bologna city centre to the airport. Public transport: Shuttle buses and public buses. 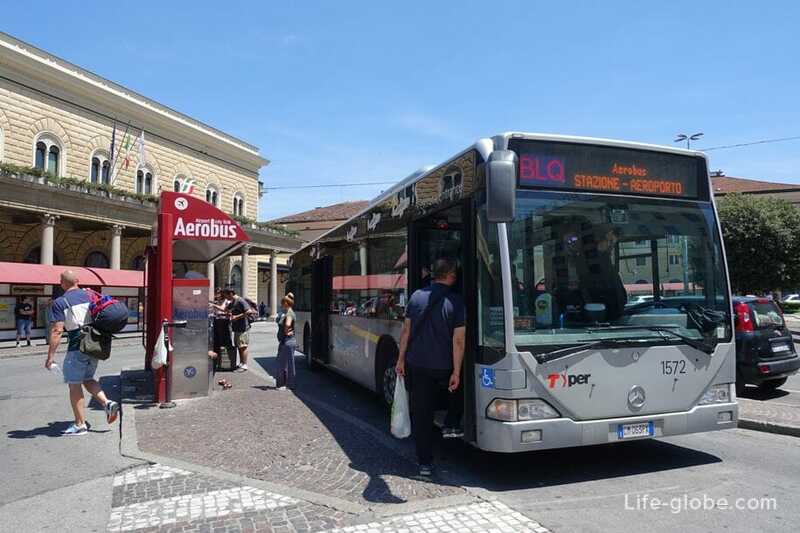 Regular Shuttle Aerobus-BLQ - fastest way to get from Bologna airport in Bologna, and from Bologna city centre to the airport. 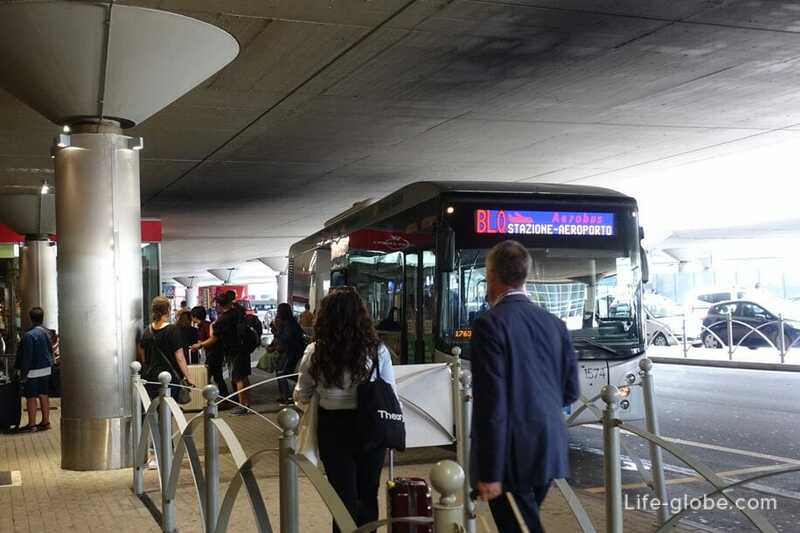 A Shuttle bus connects the airport to Bologna center and train station (Bologna Centrale). The last stop: airport Bologna - train station Bologna. Timetable Shuttle: daily, with regularity every 11 minutes - the first trip from the airport at 5:30am 00:15; the first trip from the station at 5:00, the last at 23:35. The journey time isapproximately 20 minutes, depending on traffic. The fare one way is 6 Euros per person, the price includes Luggage. Children below 1 metre is free. 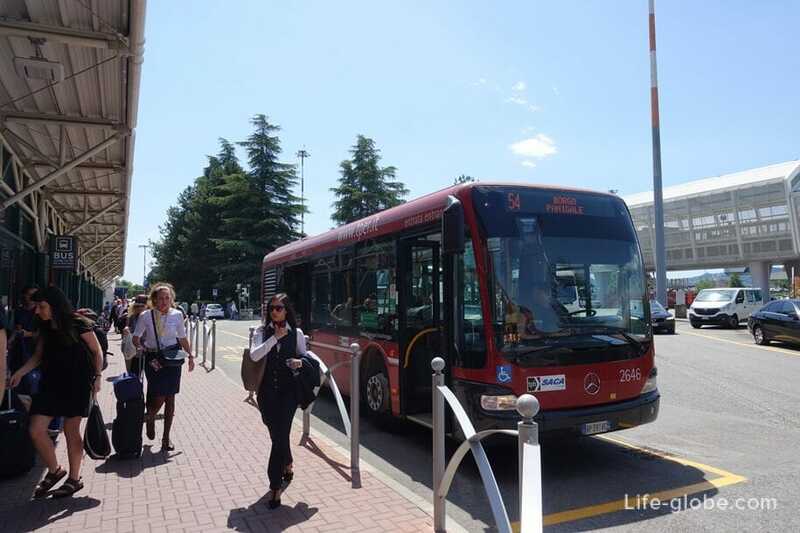 Tickets for the Shuttle can also be used on municipal public transport TPER the urban area of Bologna for 75 minutes. 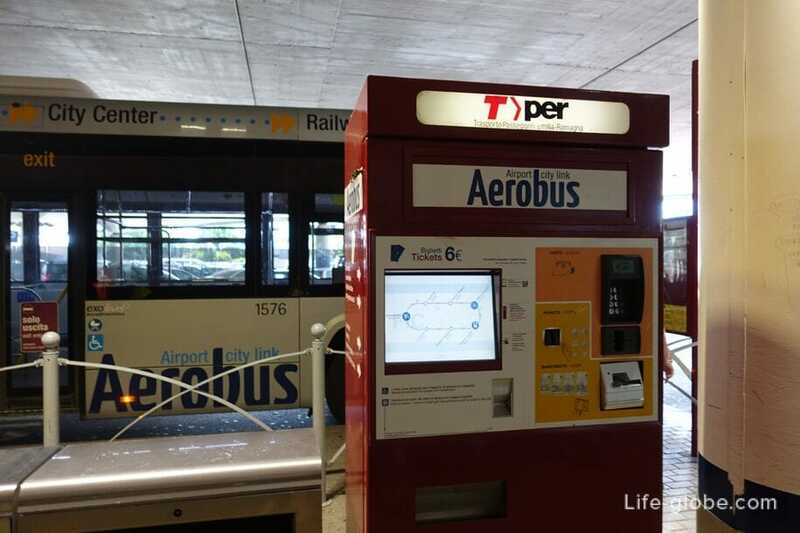 If the ticket is purchased online, for use in other vehicles, in addition to Airbus, e-ticket, to be replaced by magnetic, using the automatic machines located at the airport and the Central railway station. Tickets can be purchased online at the official website of the company, as well as at the airport or near the station or at the ticket office TPER. 1. At the machines located on the first floor near the exit, near the check-in for flights, or in vending machines located on the street (near the airport building) just before the stop of the Airbus. 2. 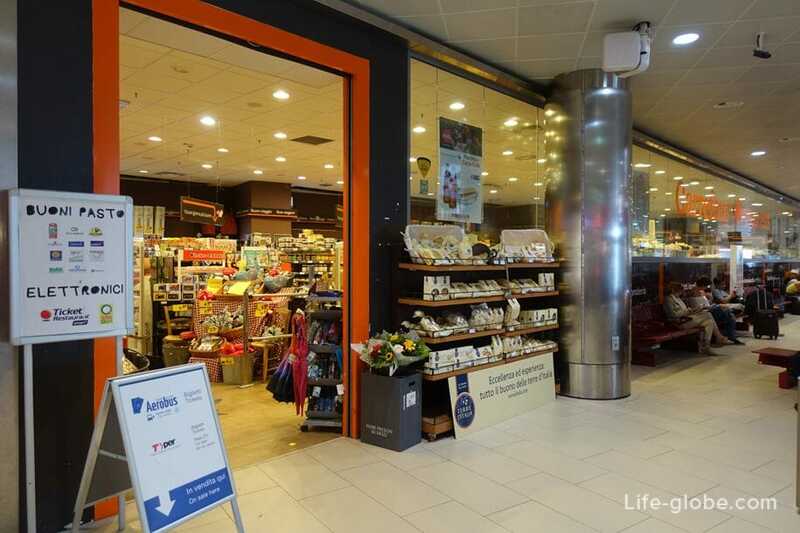 Tickets can be purchased from the sellers of the cigarette Department of the store Carrefour Express, located on the first floor of the airport building. Go to Carrefour and immediately at the front left, where they sell cigarettes, lottery tickets, etc. buy a ticket. 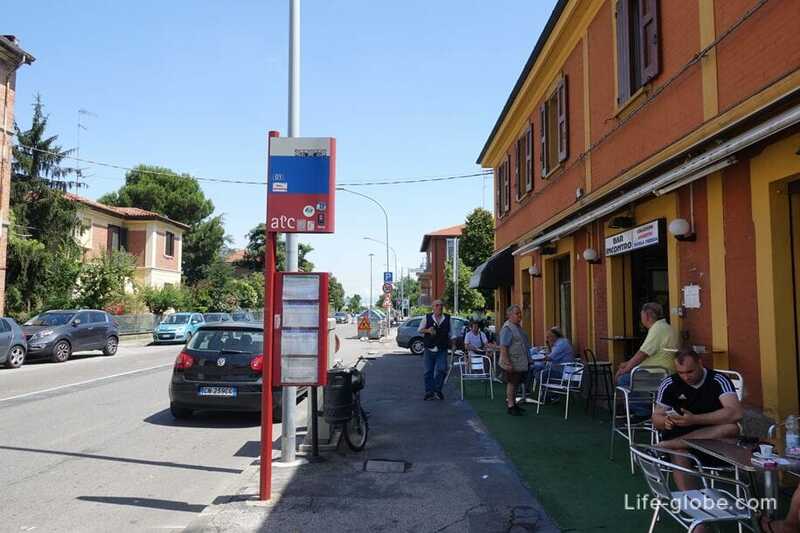 Near the railway station of Bologna is a stop that says "Aerobus", here, at the bus stop located vending machines for tickets. If you have any problems or questions, stop there are workers who are always ready to help. 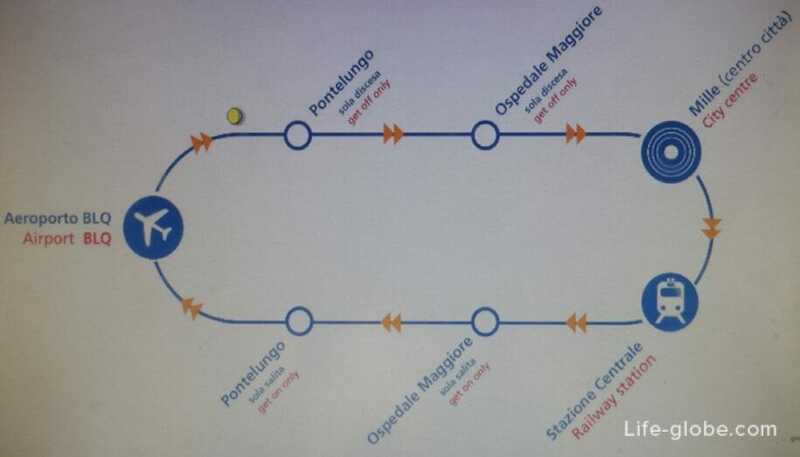 The cheapest way to get from Bologna airport to the centre or from the centre of Bologna to the airport. From the airport to the center, and from center to the airport, this car will have to go with change. There is no direct bus. The fare will amount to 1.30 Euro. Tickets at the airport sell in the same store Carrefour Express, and tickets for the Shuttle bus. 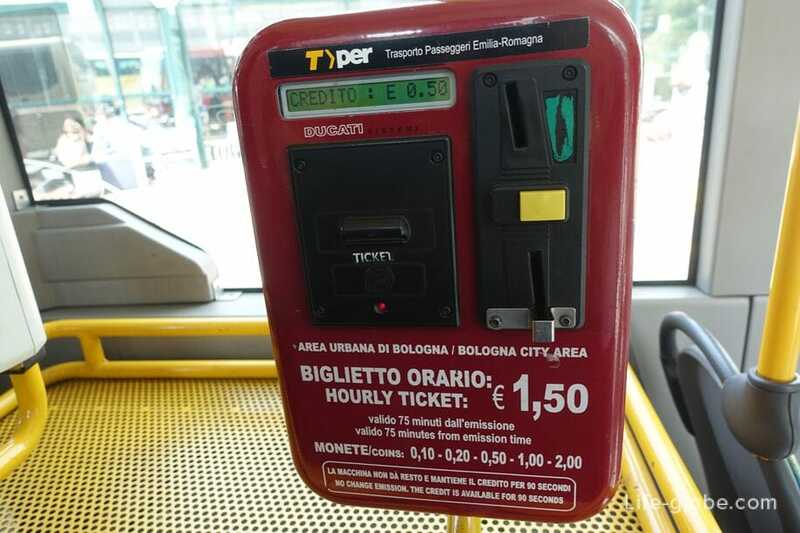 You can also purchase a ticket directly in the bus, in the machine, but the tickets on the bus will cost € 1.50 and the machine only accepts coins. Ticket when entering the bus, and at every subsequent change in the route should be marked. The journey is 75 minutes after the compost. So that you can reach the centre on one ticket with a change, the main thing that the time does not exceed 75 minutes. Stop at the airport is to the left from the main exit of the airport. Exit, turn left and go to end. Here is the bus schedule. We need bus number 54. Out of the 54 bus to four stops. First of Birra, the next - Due Ponti, then Acquedotto Triumvirato and Triumvirato. Next the bus turns right, and if you need a center of Bologna, we left. Out on one of the four stops, will not leave from the bus stop, waiting for the next bus. The center will take buses No. 81 and 91. 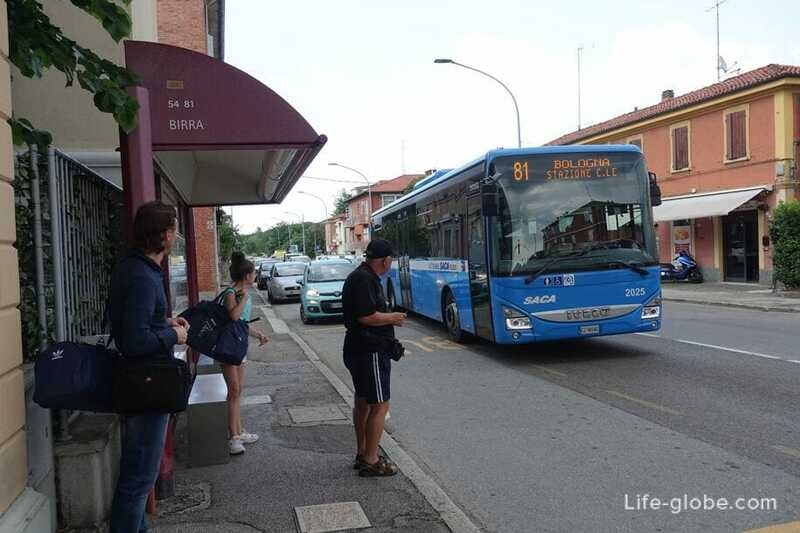 Both buses make a few stops in the center and end train station of Bologna. If you want a historical center, it is best to get off at the stop Marconi. 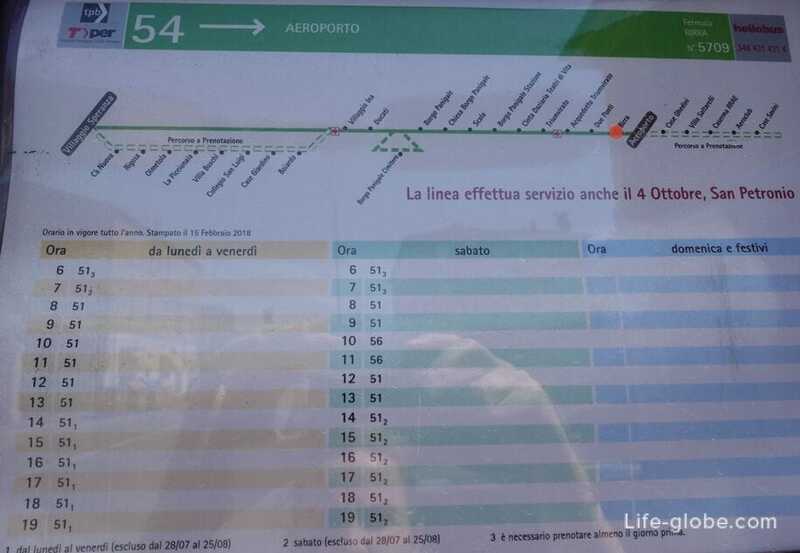 From the centre of Bologna, following the bus 81 or 91 should go only to any of the above 4 stops (Birra, Due Ponti, Acquedotto Triumvirato or Triumvirato). If there is no time to wait at the airport bus No. 54 to the stop Birra walkable distance of about a kilometer. Tickets for buses 81 and 91 and some other urban routes are not sold in the bus (possibly because not all the buses are equipped with machines). In this case, tickets must be purchased at some coffee bars and tobacco shops. Stop Birra (the one in the direction of the airport) tickets are sold at the bar. 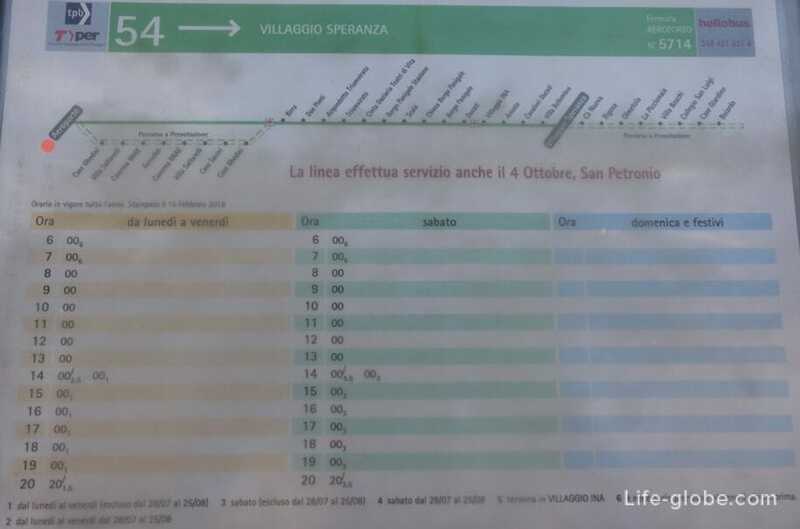 If you are going within 24 hours, more use of public transport to the city centre of Bologna, you can buy a 24-hour pass for€ 5. The ticket should verify (validate) in the beginning of the route and each subsequent route change by inserting the ticket into the validator. To clarify the schedule of city buses and the cost of the tickets on the official website of Tper. thank you very much for this detailed explanation.